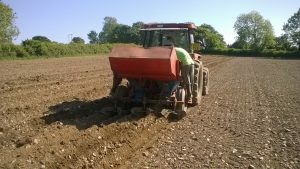 As I start planning my 2017 season, it’s an appropriate time to look back on 2016 – my first season growing seed potatoes commercially. Financially, I can’t say it was a resounding success but from the outset I looked upon this first season as a learning experience, and from that point of view it has done its job and then some! 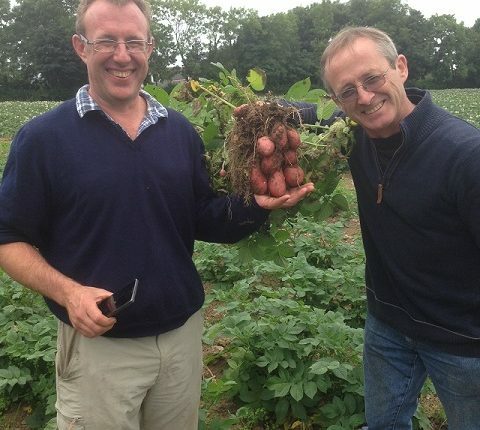 Spring will mark the beginning a new phase for Sarpo Potatoes Ltd, and we’ll be bringing a number of new growers into the fold, some of whom will be producing for the first time. This blog is mostly for you, and I hope my experience as a novice will help you start out on your seed growing career. Potatoes require good ground. They are a relatively hungry crop so fertility is important. However, too much N will prevent crops from maturing and prevent rapid skin set. Not a problem for me as an organic grower, but if you are applying synthetic fertiliser, you need to be careful. The soil structure needs to be open for good drainage and robust enough to be ploughed, power harrowed, ridged and generally knocked about. And, of course, deep enough to ridge up. It is tempting, while you are in the experimental phase, to use land that you do not rely on for your current enterprises, which by definition is poorer ground. That way lies disaster. My main problem was stones. There’s nothing wrong with a few; in fact they can help with drainage and store heat. However, the sheer volume – combined with a weed problem – slowed down the harvester considerably and, at £30/hr, really drove up my costs. Man y of my problems stemmed from not having the right kit on the right settings. Critically, the planter I used was stuck on 12” settings, and try as I might I couldn’t get it down to 8” seed setting, so crucial to getting a) a decent yield and b) the tuber size right. With kit hire and labour costs racking up by the hour, I decided to press on. Even then my troubles were not over – constant jamming gave me a gappy stand, which in turn let weeds in, a problem I never really got on top of despite ridging up 3 times and spending many hours hand weeding the worst bits. I filled in the gaps that showed up 3 weeks later by dropping in more seed but the plants that grew never caught up with the rest of the crop. So here’s the lesson: if you don’t have your own kit, spend time familiarising yourself with the machines you are going to use, and see them in action before you start if you can. I know it’s spring and there will be a hundred other priorities on the farm but in the long term, believe me, it’s worth it. I would have saved 3 days of ultimately fruitless gap filling, another 2 in hand weeding. My yield would have been at least double had the seed rate been correct and weeds managed properly – and I might well have turned a profit. Harvesting had its issues too. The main problem was that I couldn’t find a harvester with a seed net, so I lost a lot of undersized tubers. In terms of profitability, that’s not such an issue, because the price you get for outsized tubers is low, but they are valuable to SPL. It was an unnecessary waste which will not endear me to my seed company! In areas where ware, let alone seed, production is minimal, it will be hard to find machines with the right set up. One of the aims of the Sustainable Potatoes Wales project is to improve the stock of machinery available to members of its ‘cluster’ group and facilitate sharing. I am proof, if proof were needed, of just how important that is. Let’s talk about something I got right! Success hinges on whether your crop passes the APHA inspection and can be certified. The specifications are extremely tight and if the crop fails it’s of little or no value to the seed company. You need to pass two field inspections while the crop is growing. Inspectors are looking mainly for viruses (generally not a problem with Sarpo varieties), blackleg and presence of a potato variety that should not be present. Getting through is largely a case of ruthless roguing. I went through the crop twice before my first inspection and once between inspections. Spotting problem plants, especially those at the early inspection is an essential skill. I’m getting progressively faster and more effective. I’ll also have to pass a tuber inspection before marketing, when inspectors will be looking for several diseases (all the main rots, gangrene etc), soil contamination, physical damage and misshapen/shrivelled tubers. There are different tolerances for different grades, but even at the lowest grades, tolerances are very tight. This is really important. 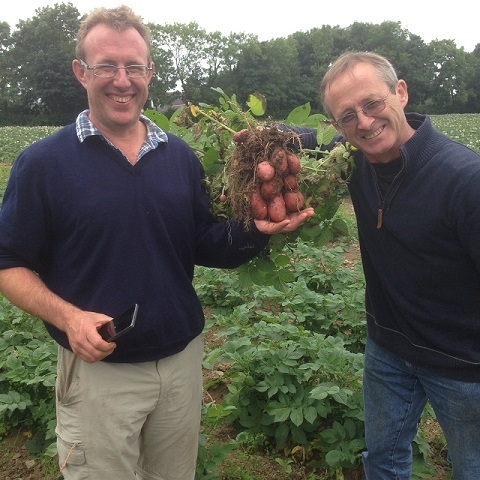 The price I get for tubers in the 35 – 60mm is more than 3 times that of over and undersized tubers, so it really pays to monitor the crop carefully towards the end of the season. 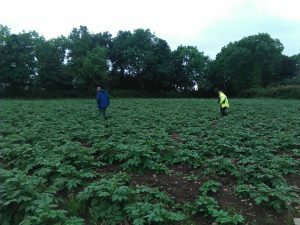 I sampled 20 plants in a ‘W’ shape across the field and measured, weighed and counted tubers, and I did that three times before I judged that the time was right to take the haulms off. It is quite time consuming, especially all that weighing and measuring, so while I was at the AHDB seed potatoes event, I was delighted to be introduced to an app, developed by Agrovista that does it all for you. You just lay out your sample on the ground, take a picture, up load it to the app and it spits out the data for you – all for £1 a shot! The bottom line was a loss of about £750/ha, the result of a combination of low yields and high costs. I also had a land rental cost of £285/ha, which you may or may not have to bear. I can’t pretend I’m not disappointed, but I can see where I went wrong, and – most of it – I can put right next year. My low yields go back to my planting, in the main part. A simpler, more appropriate planter will make sure my seed rate is right (and 25% higher than this year). Eliminating gaps will bring the weeds under control, and next year I’ll have access to much more manure which will boost my fertility. My high costs are mainly linked to harvesting. Weed problems and stones slowed us right down, and at £30/hr for the machine and £14/hr for the labour, these problems racked up my costs per hour while the low yields drove up the cost per tonne. In all about 275 man hours went into production (about 195/ ha) of which about 170 were my own, either directly or as part of a labour exchange agreement. I’ve included everything in this; the time in the field from stone picking after ploughing up to harvest, and the project management time (getting people and kit in the right place at the right time) which was significant for me. Again this is high, and I can bring my own time down substantially next year. If I get my planting right, I’ll save myself 30 odd hours of gap filling and another 28 in hand weeding. I’ll have better access to basic machinery next year which will bring the project management time down to something reasonable. Growers with their own kit and some experience under their belts will find the job a lot easier that I did. But if I address all the problems I’ve highlighted above, I should be able to bring my yields up to about 15t/ha, and my gross margins up to about £900/ha. My casual labour will be about the same, but I hope (in fact, given my other commitments this year, I need) to get my own time down to about 100 hrs. If I achieve that, I will consider this year a worthwhile investment. And I think that’s how you have to look at the early years of your seed production career. You may not make the same mistakes as me – having read this, I hope you don’t!- but you are bound to struggle initially, and you need to be prepared for that. It is, I’m afraid, an essential part of the learning process.